The Hell Bent Steel Dodge Ram Steering Stabilizer is designed and built to the high-quality standards for which Hell Bent Steel is known! 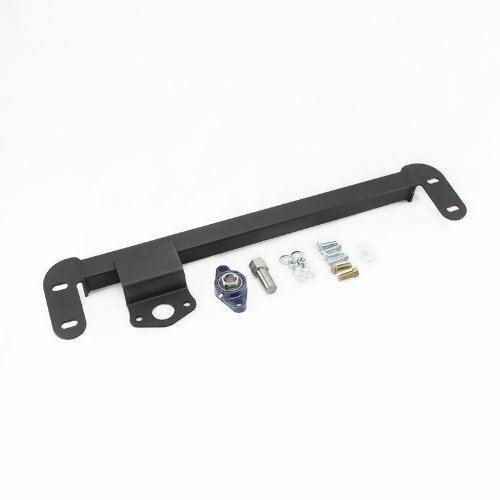 The HBS Dodge Ram Steering Stabilizer is constructed from heavy-duty steel plate ant tubing with specially formulated corrosion-resistant powder coating. The stabilizer bar is a simple bolt-on installation for immediate results. The HBS Dodge Ram Steering Stabilizer will dramatically reduce or eliminate the play in the steering, also known as steering "wander," for which Dodge trucks are notorious! In a stock solid axle Dodge Ram, as the wheels turn left and right the sector shaft in the gear box is repeatedly loaded and unloaded from the side. This sideways loading will, over time, wear out the internal components of your steering gearbox causing it to fail. The HBS Steering Stabilizer carries the side-acting loads which allow the shaft to move freely and dramatically extends the life of the gearbox. The HBS Dodge Ram Steering Stabilizer is not intended nor is it designed to be used as a replacement for a worn-out gearbox or other steering components. The stabilizer bar will extend the life of a properly functioning steering gearbox.